> YOU HAVE ONE FILE PENDING REVIEW. DISPLAY FILE? An SCP-1548 event during formation. Special Containment Procedures: Foundation satellites MALAKBEL-1 through 10 will monitor the south pole of the Sun for SCP-1548. Under Protocol Koyash-Veure, all Foundation space stations and off-planet bases within the solar system will have the monitoring of the Sun as their secondary mission objective. Connections will be maintained with major space agencies under Operation STYGIAN IRIS for enhanced monitoring of the anomaly, with accurate information on the phenomena restricted to specified personnel. As it is not feasible to place limitations on all solar telescopes, it is expected that civilians will observe SCP-1548 on occasion. Foundation personnel embedded in scientific agencies will disseminate misleading information on SCP-1548 and all thaumaturgic symbols that manifest, describing them as unusual but natural phenomena. All other information of the anomaly and related symbols is subject to standard Foundation censorship protocols. SCP-1548-1: Six equidistant ovular sunspots, approximately 40,000 km x 15,000 km in size, appear. The ends of the sunspots converge after 23 hours, often accompanied with the formation of a solar prominence1 that typically takes the shape of thaumaturgic symbols. A coronal mass ejection will then occur around the sunspots, lasting 11 hours, with the prominence dissipating after 5 hours. SCP-1548-2: Begins similarly to SCP-1548-1. A solar prominence then forms from the site of the sunspots and breaks off from the Sun, moving away from it and likely entering interstellar space. The event lasts for 2 hours. SCP-1548-3: Sunspots form thaumaturgical symbols, which range in size. This can occur in conjunction with other events or separately. Unlike the previous two phenomena, these sunspots do not commonly manifest in any single area. The first recorded SCP-1548 event was on 17-May-1983, where an SCP-1548-3 event was observed, showing Thaumaturgic Symbol-2201-V1 (refer to Addendum.1). The event was classified as Extranormal Event-9008 until similar occurrences were observed, leading to the classification of SCP-1548. Addendum.1 — Thaumaturgical Symbol Identification: The Department of Thaumaturgy has successfully identified and determined the nature of several symbols seen in SCP-1548. Below is a list of the symbols, denoted with "V" if they are a variation of the symbol ("V1" denotes the original or first discovered version of the symbol). TS-2201-V1: Unnamed; only seen in SCP-1548. If inscribed on any telescopic device by a person with thaumaturgic abilities, the device will show psionic entities with malicious intent toward the user. After a total four hours of use, users without psionic abilities will experience symptoms of psychosis. TS-381-V2: Known as the Kalaphastian Isle among various occultist groups. When affixed or projected onto a material, it will strengthen the material, enhancing its ability to absorb kinetic and electromagnetic energy. Materials may be hidden from sight as well. TS-1817-V7: Known as the 12 Holy Owls of Serrinithium; origin among humans unknown. When the symbol is affixed to a weapon or object used with the intent to harm, any entity killed by the weapon will annihilate the immediate space around it. The size of the annihilation zone is proportional to the size of the entity killed. This annihilation zone has no effect on materials reinforced with TS-381. Of note is 61% of observed thaumaturgic symbols pertain to the anomalous Ortothan mythology and religious beliefs.2 TS-1817 originates from Ortothan occultists in the 1800s, and TS-381 has been used by members of the Church of the Second Hytoth, a prominent Ortothan group of interest, in avoiding capture by the Foundation. Why this is the case is unclear. Addendum.2 — Event 1548-29: On 23-December-2016, several SCP-1548-1 events occurred in rapid succession. Although interpretation of these symbols is still underway, TS-381-V2, TS-1817-V7, and TS-2201-V1 manifested multiple times during these events. Twenty non-anomalous Ortothan language symbols and phrases for protection formed as well. 47 hours later, five SCP-1548-2 events occurred in the span of two hours. Over the next month a dense cloud of ionizing radiation began forming around the solar system, surrounding the heliopause3. Although initially at largely unnoticeable amounts, the cloud increased in magnitude until no light from the outside universe could enter by 20-January-2017. The origin of the cloud is presumed to be from the sequence of SCP-1548 events, though the combined amount of particles produced was too small to form a structure on this scale. Of note is that Foundation telescopes have noticed thaumic tessellations4, resembling grids of pyramids, periodically forming along the cloud. As the night sky is now entirely altered, Foundation censorship protocols cannot be fully executed. The dissemination of incorrect scientific information regarding the solar system entering a dense cloud of cosmic dust is in progress. Scientific information describing the actual nature of the ionizing radiation cloud will be censored as per Contingency Galileo-II. Addendum.3 — Recent Phenomena: Following Event 1548-29 a high amount of significant anomalous phenomena have occurred. The following is a list of the events, updated as of 26-January-2017. 24-December-2016 The Falcon Light5 suddenly lost 50% of its mass during its flight to the ISS, causing the death of all crew. Foundation satellites captured video of the event, showing that half of the spacecraft disappeared along the mid-line, jettisoning any crew still inside into the Earth's atmosphere. Radio signals were received soon afterward from beyond the heliopause. Although suspected to originate from the other half of the spacecraft, the decoded signals match no known spoken or written language. All launch plans for manned space craft have been canceled, both inside and outside the Foundation. A cover story involving a faulty booster has been disseminated. 29-December-2016 The International Space Station ceased standard communications and began broadcasting visual and auditory cognitohazards. All subjects exposed to any of the cognitohazards enter a trance state and eventually have their brain vanish. Two hours after, Foundation satellites detect a sharp increase in thaumaturgic particles in orbit, all found to be originating from the Sun. The ISS abruptly changes trajectory to follow a course that will result in reentry, certain to destroy the entire station, in February of 2017. Classification of the ISS as an anomaly is pending approval. 2-January-2017 SCP-2713 was found to be entirely empty. Most of the interior of the building had been destroyed. Claw marks, scorched walls, and blood strewn across the room indicates signs of a significant struggle. Reclassification to neutralized is pending approval. 5-January-2017 During a political demonstration in front of the Reichstag in Berlin, Germany, a thaumaturgic Way leading to an unknown pocket dimension opened near the protestors. Koru Archpriest Farah Onteus, Church of the Second Hytoth leader and known person of interest, exited and announced that "a shelter had been built." Further information is limited, as all persons in the area promptly entered the Way, including two undercover Foundation agents. The Way closed immediately after. Censorship of the event is in progress. 10-January-2017 An unknown eigenweapon6 was activated during protests at Times Square. A violent explosion destroyed the entirety of Midtown Manhattan, leveling surrounding buildings and severely damaging other nearby areas within a 6km radius. The death toll is undetermined. A high number of Tartarean entities and demonic possessions have been observed in a 11km radius around the blast's epicenter. Persons with confirmed connections to the Chaos Insurgency have publicly blamed the event on "a global shadow organization." 19-January-2017 SCP-179 established contact for a single moment, signing "Defend," before descending below the Sun's surface and vanishing. The frequency of SCP-1548 events has dramatically increased since this event, with at least two occurring per day. 20-January-2017 The radiation cloud fully obscures the night sky. Global amnesticization under the Ennui Protocol is enacted by the Foundation and completed at 78% efficiency. Several paramilitary organizations (which includes world governments and anomalous groups) take this opportunity to attempt to further their own personal goals. Joint Foundation and Global Occult Coalition forces have been assembled to combat these groups. Efforts are ongoing. 22-January-2017 SCP-2821, following a sudden expansion in size to a diameter of 1.7km, vanished. The nearby Lunar Area-32 suffered a minimum of 38 casualties and lost ten anomalies from the expansion enveloping and destroying sections of the facility under the anomaly's different laws of physics. Based on readings from Minkowski Spacetime Monitors, it is hypothesized that SCP-2821 formed a wormhole leading to another region of the universe. Misinformation to explain the newly formed hemispherical crater on the lunar surface is being disseminated. 25-January-2017 Experimental Foundation devices began detecting tachyons moving at undetermined faster-than-light speeds. Analysis found that these are likely a new form of SCP-3417 transmission, though with major deviations from their standard contents.7 This was observed until being abruptly cut off, presumably due to the radiation cloud. Further information is below. Transmission interference for 1 minute. SCP-3417: —would not have won without Ortothans. [Unknown Symbol 31] lost. The gods defended Ortothans and existence, Ortothans defended the gods and existence. 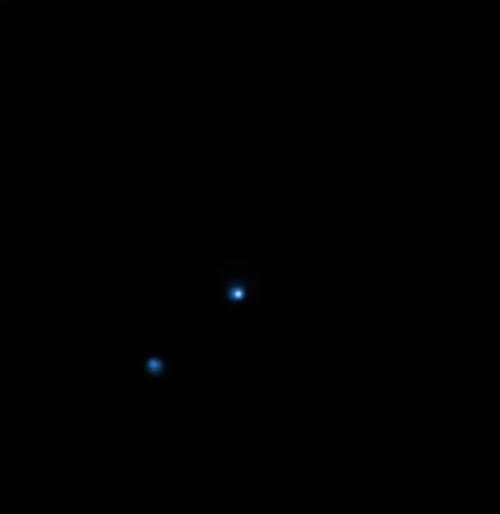 [Illuminated Star System?] lost. When united we are strong. Transmission interference for 25 minutes. Joint Foundation and Global Occult Coalition forces have been mobilized for large scale containment and threat neutralization operations. Cooperation with various governments to assist in coverups has begun, though these measures are hindered by the decisions of the Latvian, Estonian, and Georgian governments in declassifying documents on anomalous phenomena and Cold War paratech. All major containment sites are now under Level V High Security Lockdown until further notice. 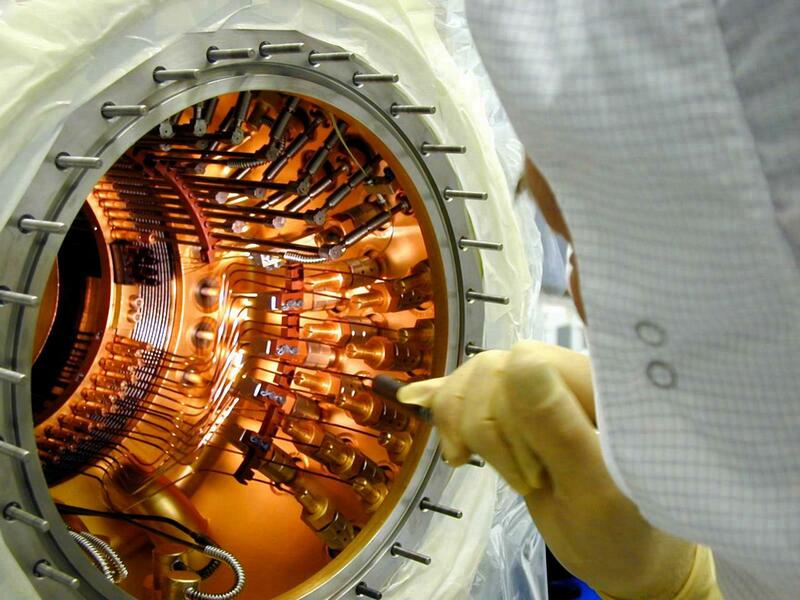 Adjustments being made to Seraph-1's thaumaturgic particle detector. Addendum.4 — Experiment 2154-37: On 12-June-1999, it was determined by a unanimous O5 vote to enact a long term plan to explore beyond the heliopause. Mission objectives were to confirm or deny hypotheses regarding extraterrestrial SCP objects and collect data on anomalous phenomena beyond the heliopause. As such, the Foundation probe Seraph-1 was constructed then successfully launched on 09-May-2000. On 27-January-2017, an SCP-1548-1 event was initiated prior to Seraph-1 reaching the heliopause, forming the thaumaturgic symbols used in predicting the future. Following the SCP-1548-1 event, an SCP-1548-2 event was initiated and launched. This one, however, deviated significantly from normal trajectories and curved sharply about 100 AU away from the sun, towards Seraph-1. Seraph-1 crossed the heliosphere two days before contact was lost from the intense radiation inside of the solar prominence. All information collected by Seraph-1 is currently under review and pending declassification. 1. 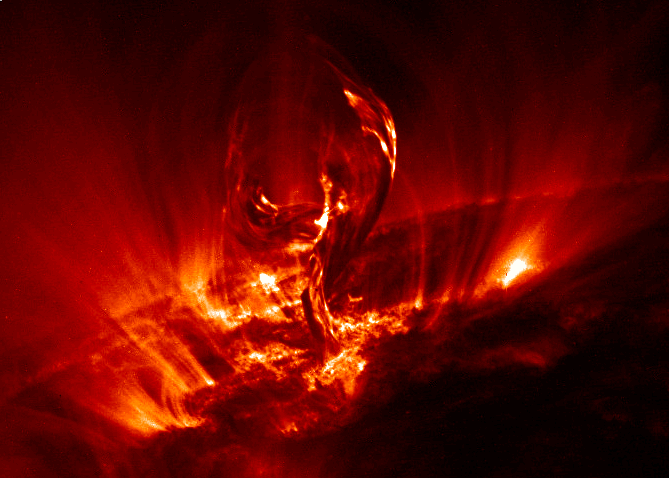 A large gaseous feature that extends off the Sun's surface, normally forming a loop shape. 2. The central aspects of Ortothan mythology are that the universe is the second universe to exist, and that it has been protected from extra-universal invasions by seven guardian deities. Only one of these deities, Rakmou-leusan, the "Holy Fourth," is said to be alive in the present day. 3. A region surrounding the solar system where solar wind collides with interstellar wind, creating a "bubble" around the solar system known as the heliosphere. 4. Patterns of grids of polygons formed when high amounts of thaumaturgic energy is released. 5. A commercial spacecraft made and launched by aerospace company SpaceX. 6. Anomalous weapon of mass destruction. 7. Transmission contents have typically contained mentions of extraterrestrial civilizations and Ortothan mythological stories. 8. Observation by Foundation telescopes spotted a corresponding "hole" and distorted thaumic tessellation patterns at the region of the solar system where Seraph-1 passed the heliosphere. 9. A term used in Ortothan texts that refers to the Milky Way Galaxy. > THERE ARE SIX RELATED FILES. ACCESS FILES? MOTION AS FOLLOWS: END VEIL PROTOCOL UNDER CONTINGENCY UNCLOAK-III. MOTION AS FOLLOWS: RECLASSIFY SCP-1548 AS THAUMIEL AND BEGIN MANUALLY INDUCING SCP-1548 EVENTS UNDER PROPOSAL 1548-12. Seraph-1 is ~100km away from heliopause. The entire region appears as a barrier of ionizing radiation, resembling a cloud and glowing a dull orange. Highly complex geometric patterns form on the surface, most 10,000km across. After an hour the probe begins passing through heliopause, entering interstellar space, and contact is lost. A connection is periodically reestablished over period of two days, though the only meaningful data obtained is a tachyon transmission from SCP-3417. After that period a stable connection with the probe begins. Many pieces of equipment were disabled by the radiation, though a rear camera continued to be operable. Swarms of entities can be seen in the distance, surrounding the heliopause. The bodies of each entity are highly asymmetrical and possess numerous appendages and unknown structures. The only common features are a gray body coloration, segments that erratically flash various colors, and fractal structures. Sizes are estimated to range from 10km to 10000km, though some appear to be significantly larger on unknown scales. Two of these entities (hereafter 1548-Ω-1 and 1548-Ω-2) pass by Seraph-1. 1548-Ω-1 is eel-like in shape with five arms extending from random sections of its body, along with a "mouth" made of impossible geometric structures. The end of its body is surrounded by arachnid limbs and frequently flickers into being translucent. 1548-Ω-2 is an oscillating and contorting tetrahedral object, leaving trails of black rocks that rapidly disintegrate. As the entities near the hole the warding sigils glow red, causing red shock waves to appear around each one, significantly slowing their speed. 1548-Ω-2 "unfolds" its body and releases glowing white orbs, which reach the sigils and expand into spiral patterns. The sigils demanifest and the shock waves lessen in luminosity. 1548-Ω-1 passes through the hole and accelerates out of Seraph-1's view. High amounts of thaumaturgic particles are detected and the hole is rapidly enveloped by solar flares. Hundreds of concentrated blasts of thaumic energy are shot out of the new flares and pierce through 1548-Ω-2, vaporizing it in seconds. At this point, the 27-January-2017 SCP-1548-2 prominence passes through the heliopause, encountering Seraph-1 an hour later. Contact is permanently lost. SCP-3417: —lost. All near Ortothans must unite at [Unknown Symbol 31], cannons have been moved into orbit around the planets. The extra-universal invasion lessens. The gods protect us. Ortothans will survive. Pause in transmission for 7 minutes. Pause in transmission for 1 minutes. The transmission begins displaying a sequence of spiral patterns and an encrypted image, found to show an entity resembling SCP-2821-2 when decrypted. The transmission ends. Afterward: A reclassification of SCP-3417 to neutralized is pending approval. EVENT SUMMARY: On 30-January-2017, the Foundation orbital vessel SCPS Curtana was fully outfitted with experimental anomalous weapon and propulsion systems. It was deployed to neutralize 1548-Ω-1, which had destroyed Pluto and other Kuiper Belt objects following its entrance into the solar system. The vehicle arrived at 1548-Ω-1's location near Jupiter and engaged with the entity. Communication with the onboard crew was lost after 10 minutes. Footage from Foundation probes show the vehicle and entity become surrounded by a black substance and vanish. 2 hours later the substance dissipated, and the SCPS Curtana was observed to be rapidly accelerating towards Mars at near light speeds, with an organic mass resembling that of 1548-Ω-1 attached to it. In 30 minutes the vessel reached the planet and impacted it, creating a crater 400km in radius, ionizing the atmosphere, and turning the surface into a molten mass. An hour after, the surface began to be converted into a black organic mass, which spread out from the epicenter of SCPS Curtana's impact. At this time an SCP-1548-2 event, the largest one on record, occurred, and the solar flare reached Mars when half of its surface had been converted. A violent explosion followed, the luminosity of which matched the Sun's luminosity when viewed from Earth. The resultant debris is expected to form a second asteroid belt within the next three months. Asteroid impacts with Earth are predicted to increase. As this event occurred 10 hours ago, all related data is still under review. > TEXT FILE LEFT BY: O5-3 ON 28-JANUARY-2017. Seraph-1 was only able to take a single picture of extrasolar space. And this is it. All that's left of our infinite, ever expanding universe. Our main priority can no longer be secrecy. > ATTENTION: THE TERMINAL HAS BEEN IDLE FOR FOUR MINUTES. THE TERMINAL WILL EXIT IN ONE MORE MINUTE. > WOULD YOU LIKE TO VOTE BEFORE LOGGING OUT? > THE O5 COUNCIL HAS BEEN NOTIFIED OF YOUR DECISION. YOU STILL HAVE THREE DAYS TO VOTE. GOODBYE, O5-6.